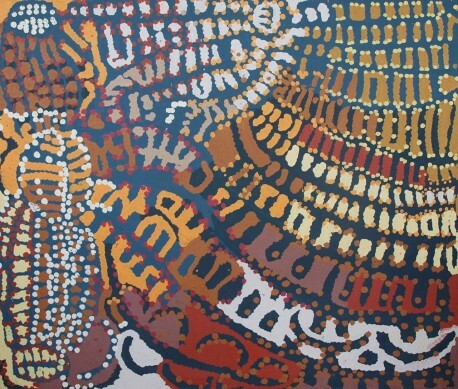 Japingka Gallery presents an exhibition of two of the great colourists of the Central Desert art movement, Kudditji Kngwarreye (born c 1928) and the late Lorna Napurrula Fencer (c1924 – 2006). These two distinctive Indigenous artists are known for their large dynamic paintings, made powerful and electric by the colour they bring to their work. Their creative output has helped expand the realm of traditional story-telling and painting as expressed by Central Desert artists. Lorna Napurrula Fencer is acknowledged as one of the great innovators of the Warlpiri art movement from Lajamanu, and was both a fierce and gentle custodian of her culture. Japingka Gallery worked closely with Lorna Napurrula during the last eight years of her life, and witnessed the great range and intensity of her paintings as she prepared work for exhibitions to be held around the country. Lorna’s subjects included the great Napurrula-Nakamarra creation stories from her brother’s custodial site at Yurmurrpa. These ceremonial stories re-enact the myths of the Ancestors who pulled out the first yarla, or bush potato, from the earth around the underground water source at Yurmurrpa. Lorna Napurrula’s large epic canvases created in the eighth decade of her life were final and compelling statements about the power of the great Warlpiri stories that she painted for over twenty years. The retrospective exhibition of Lorna Napurrula’s work entitled ‘Yulyurlu’ is touring nationally and has exhibited in Northern Territory, New South Wales, Victoria and South Australia. Kudditji Kngwarreye is an elder of the Eastern Anmatyerre country from Alhalkere on the Utopia homelands, and was born around 1928, the younger brother of renowned Utopia artist Emily Kame Kngwarreye. Kudditji Kngwarreye has painted for over twenty five years, and constantly represents his traditional country around Boundary Bore on the Utopia homelands, the country for which he is a custodian. Significant throughout this country are the Emu Dreaming sites, where major men’s initiation ceremonies are performed. The Emu Dreaming is one of Kudditji’s inherited ancestral totems, and is regularly referred to in his paintings. Kudditji’s great paintings evoke the lyrical images of his country by concentrating on the colour and form of the landscape. Using densely applied paint to create broad sweeps of colour, he creates images of the intense skies of the desert rainy season and the extreme heat of high summer. A sense of immense space can be felt in the paintings. The work of these two great artists will be on view at Japingka Gallery from 3 August to 12 September 2012.